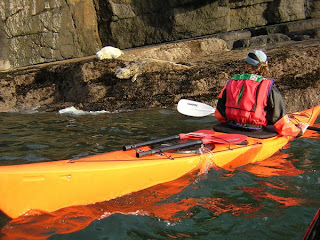 One of the reasons people paddle on the sea is to watch wildlife. So be aware of the needs of the creatures you like to watch. Seals and sea-birds often hang out on rocks and ledges. Some sea birds socialise in rafts out on the water. 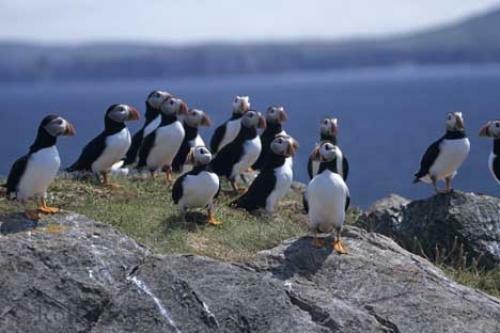 Sea birds often cluster on cliffs to nest. Watch the change of behaviour of birds and animals as you approach. You'll see them become alert to your presence. If you move closer they'll show restlessness and maybe agitation, before they finally flee. If you're aware of the pattern, try to watch and pass by at a distance that doesn't disturb. Although there are many reasons a colony of birds will take flight from their nests, the more frequent the disturbance the more likely the breeding season will fail. So if you're out for the fun of weaving your way along a coastline between stacks close to the cliffs, avoid the locations where there are a lot of birds, or a lot of seals. There are usually plenty of alternative play spots. If you're out to watch the birds and seals, seek a quiet spot where you can watch without causing disturbance.